For Chloe's first birthday, my sister in law wanted to take pictures for a 'cake smash'. I thought it'd be really cute for Chloe to wear a tutu for it. I had been looking at tutorials for tutus and figured it was about time for me to finally make one for her. 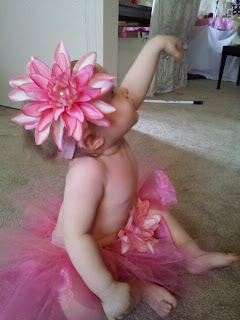 I was really excited to do this, because I LOVE tutus but they seem really expensive to buy. I made this one for Chloe and spent less than $5 on it and used three different fabrics. This was also the first article of clothing I've made so was even more excited when it actually turned out. This was super easy and only took about 45 minutes to do, including cutting the fabric. I bought the flowers on sale from Michael's in a Spring bunch and I took one apart and glued it back together and glued a bead in the middle and a hair clip for her headband. For the band part, I cut up a pair of tights and sewed the ends together then clipped in the flower. The colors I chose were pink and orange, but you can't see the orange very well. These are very delicate so hand wash only!